Massys was the leading master of his time in Antwerp. International in his outlook, he combined the carefully detailed and brilliantly colored surfaces of the Flemish tradition with the more monumental and expressive figure types found in Italian and German art. 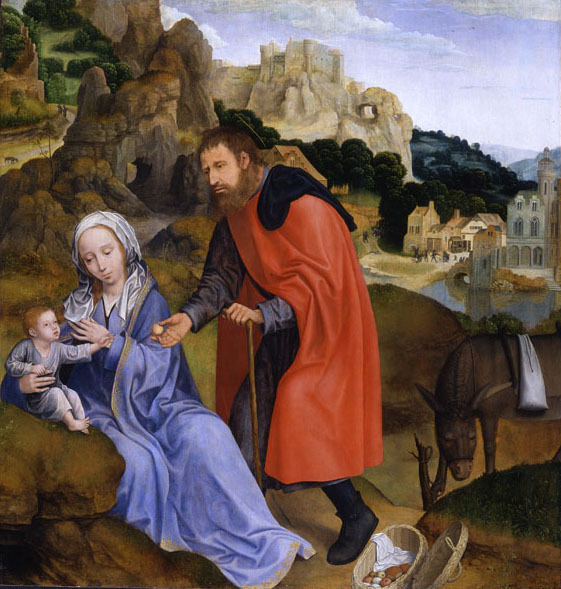 The Rest on the Flight into Egypt was originally part of an ensemble of eight paintings representing The Seven Sorrows of the Virgin, made for the main altar of a monastery near Lisbon. The other panels are also now in museums, seven in Lisbon and one in Rio de Janeiro. In the Worcester panel, against a scene of slaughter taking place in the background, the Holy Family is shown fleeing to Egypt to escape King Herod's execution of all children in Bethlehem two years and younger. Massys's sensitive rendering of the expressive faces of the main figures conveys the deep emotions associated with this event. His attention to the landscape, in particular the complex rock formations, is notably advanced for the period.